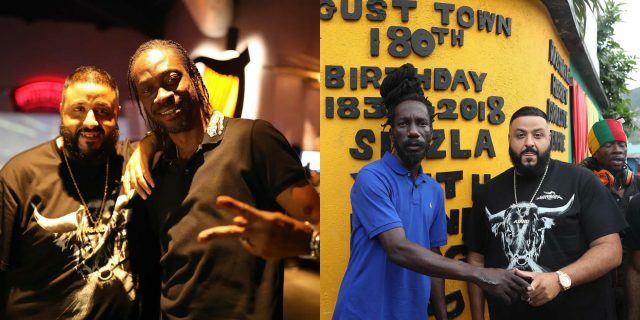 Dj Khaled has now linked up with Buju, Sizzla, and Bounty Killa since he arrived on the island on Sunday for the first time in 12 years. On Monday, Khaled shared photos and videos of himself and Buju teaming up to add authentic Jamaican vocals to his forthcoming album, Father of Asahd. Later that evening vibed with Reggae star Sizzla in ‘Judgement Yard’ August Town, St Andrew. He then later caught up with Dancehall icon Bounty Killer. Dj Khaled’s association with reggae and dancehall music, goes as far back to the early ’90s when he often visited Jamaica to play at dancehall events, particularly the Fully Loaded series of beach parties organised by Solid Agency. He has also worked with other Jamaican artistes notably, Mavado and Sizzla, and is also a big friend of Bounty Killer.